On March 26th, head on down to building 6 and catch a “Sneak-Peek” of our upcoming Artist Spotlight! 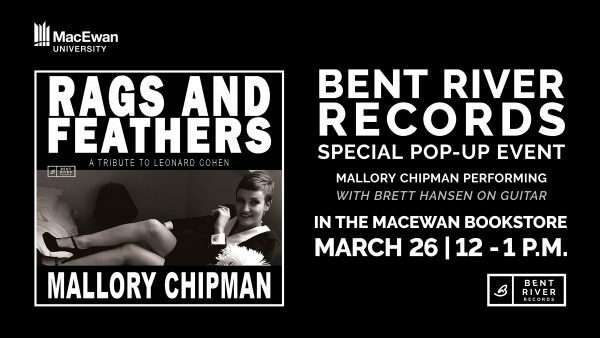 This special pop-up event will be in the MacEwan bookstore, (aka the Mstore) from 12-1pm! The Bent River Records team will be there selling merchandise and promoting our 2018 Artist Spotlight. There will be a lunch hour performance by Mallory Chipman, to give you a little taste of the magic that will happen at Spotlight in April. Speaking of the MStore, did you know that they sell Bent River Records merchandise all year round? That’s right! If you can’t make it to our sneak preview event but still want to purchase a CD (or two), they are available for purchase online or in-store. The 2018 Bent River Records Artist Spotlight will take place on April 17th in the Triffo Theatre featuring performances by Chandelle Rimmer and Tom Van Seters, Josh Rager, and Mallory Chipman. Previously known as the “Bent River Records Launch”, this event takes place annually to showcase the different projects that were completed each year on the Bent River Records Label.